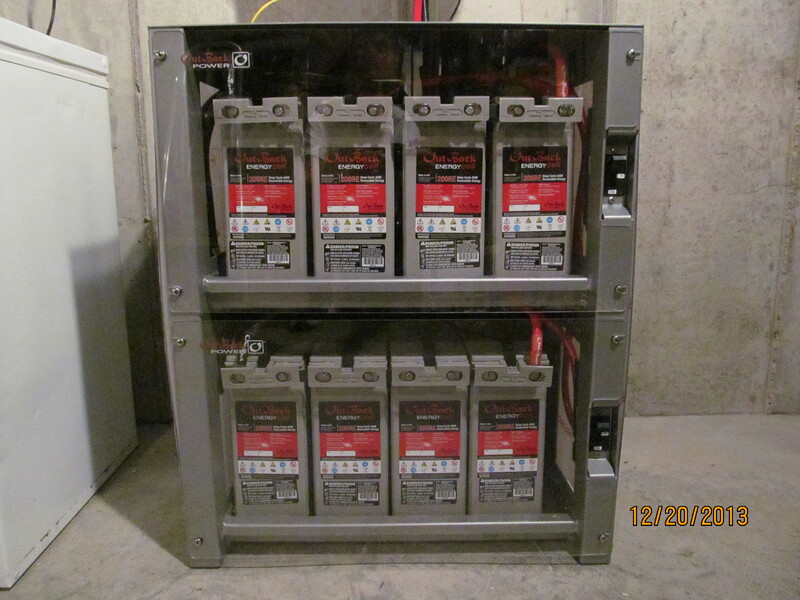 Adding battery backup – even if you DON’T have solar! It’s been a while since I posted any new activities – but only because I’ve been so darned busy! A client in Harrison Indiana wanted a a solar system installed, but he launched his project too late in the year, so rather than fight the weather, we decided to just install the BACKUP portion of the project ahead of time – giving him the benefit of a backup system for the upcoming Winter season. He lives out in the country, and encounters frequent power outages during the winter months, so this was a good compromise, and that’s what this blog entry will be about. We decided to go with the new OutBack RADIAN 8Kw inverter and the Outback AGM batteries, since they don’t require watering or venting. He had space on the wall where his current Main breaker panel was located, so we just expanded with some extra plywood. We hung the inverter and mounted the battery bank directly below it so that we would minimize the distance the 4/0 Battery cable would need to cover. Main panel location at start of project. Room to the right and below. With that plan in mind, I went in search of some 1 inch plywood, which it seems none of the lumberyards carry. I got the lumberyard to precut a 4 X 8 sheet of 1/2 inch thickness, and managed to squeeze them into our PT cruiser. A couple squirts of glue and some 3/4 drywall screws to hold them together got us the mounting plate we needed for all the things we were going to add: a SUPPORTED LOAD panel – this is the loads that will be backed up when the power drops, another outlet for the freezer next to this panel, and the OutBack MATE3 control center that lets us program the Radian and observe the voltage and operation visually. The MATE3 also provides the interface to the internet so that this can all be monitored from a PC on the web. We planned on adding solar this year when the weather warmed up, and the Radian PREWIRED INTERFACE took all the hassle out of making this all work. THe interface is directly below the Radian in the next photo. Everything inside this prewired box is clearly labeled and it would be VERY hard to get it hooked up wrong! The next step was to move the breakers and wiring for the supported loads from the main panel (at the left) to the supported load panel (in the middle). The lines were too short by a couple of feet, so I went to the electrical supply house and found some neat nylon splice blocks that have compression screws and they come in big strips of 20 or 30, so I could cut them into blocks of 3. This allowed me to splice new romex (same gauge) to the black, white and copper ground wires in a manner that was safe and in compliance with the National Electrical Code. The wood backing also allowed me to screw the splice blocks in place at the top of the board (out of reach) to keep things safe. 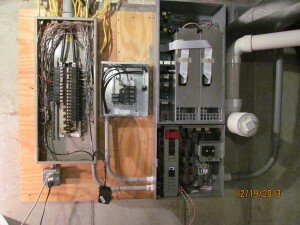 Please notice that all connections between the breakerboxes, the inverter and anything else on this board are all in conduit. The only exception is the Romex, which by code is allowed. Just remember that EVERY line of romex going into the supported load panel MUST have a strain relief. 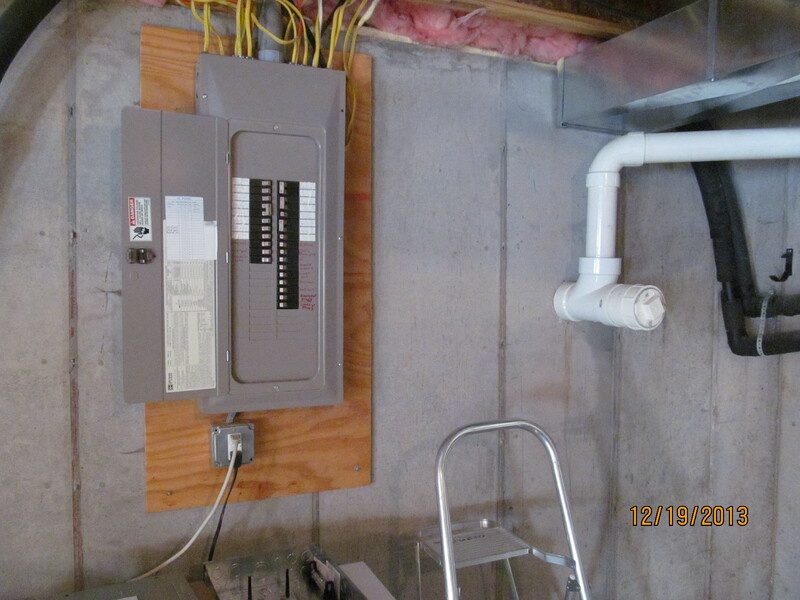 You just can’t run wires through the holes in the box – it would NEVER pass an inspection! Outback AGM battery bank. Great for no-worry storage! While I was doing all that wiring, the homeowner was busily assembling the battery cabinet and installing the OutBack AGM (sealed lead acid gel type) batteries and all the jumpers to create the battery bank. There are two banks of four batteries, which are then paralleled to achieve a sizeable AmpHour capacity. These batteries are not cheap, but they don’t require any attention like checking fluid level, or requiring a vent fan, so it simplifies the installation and use of the system. By the way, if you want a closer look, just click on the photos and you will get a full screen size view. If you look close you’ll find that there is a 175Adc breaker for each ROW of batteries in the cabinet. This will come in handy troubleshooting in the future. It also keeps things safe while connecting the battery cables. The cable used in this setup is high strand count 4/0 with FACTORY TERMINATED ring ends. No, you CAN’T use welding cable, and don’t even THINK about putting ends on by yourself. Always purchase SOLAR battery cables that are pre-terminated by your supplier. During normal operation DC current out of the battery can reach peaks upwards of 500 to 1000 AMPS. Any weak or loose connection will get hot and create a problem in no time! Almost ready to turn on. No feed from the solar just yet. 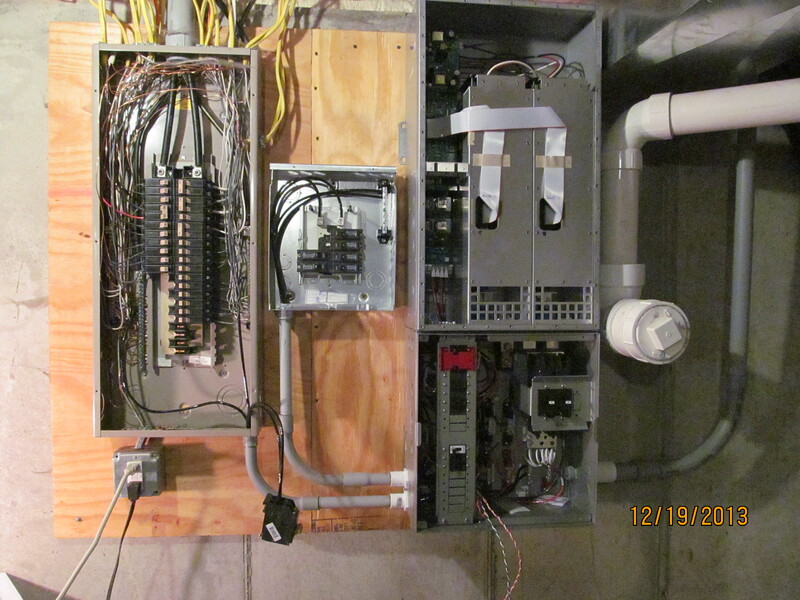 Here’s the finished installation – just a few more lines to move from the main breaker panel over to the supported load panel. If you click on the photo, and zoom in, you can just make out those splice blocks I was talking about at the top. There was just enough room below the supported load panel to mount the Mate3, and the finished installation looks pretty nice with all the brushed steel panels and covers re-installed. Other than the battery cabinet, the backup system didn’t take any additional floor space, so it was not a problem where we placed everything. The homeowner still needs to run an ethernet cable down a chimney chase from upstairs to put the system online – another project for a rainy day. I went back in the early Spring of this year to install the ground mount and a sunny boy inverter at the back of the property. This is an old farm, and the service is sort of snaked around the property. By intercepting the feed to the barns, we will be able to redirect them THROUGH the RADIAN INVERTER PREWIRE BOX, and effectively create an awesome GRID BACKUP system that will operate AND Charge the batteries when the utility power is down. In Bright sun, we have 8KW from the inverter/battery bank COMBINED with 5 to 6KW of realtime solar power to run some BIG loads like AC or the washer/dryer. If you look back at the 2nd picture, you can see TWO large boxes with cables coming from them. These are two 4Kw inverters. The RADIAN design is redundant- if one quits, you still have power, just 1/2 power. That’s better than NONE when the power is down. I think this is the best feature of the radiant design! This entry was posted in Solar and tagged backup inverter, Battery Backup, battery inverter, Cinci Home Solar, DIY Solar, DIY Solar consultant, Grid backup, grid-tied backup, Indiana Solar, Kentucky Solar, Michigan Solar, NABCEP Certified solar installer, Ohio Solar, Solar Helper, Solar Installer, solar power. Bookmark the permalink. Hi Joe. 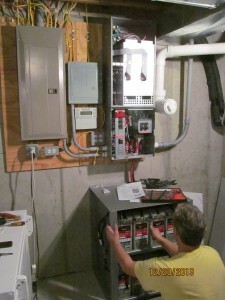 Pretty thorough description of setting up a battery storage system. I’ll look forward to working with you as I come into contact with more Ohio homeowners looking to go solar and save big.